The Oscars have come and gone, leaving us all with petticoats on our floors, bobbypins stuck in our hair, and lipstick on our pillows! OK, maybe not all of us. I’m probably one of the few to wear a petticoat these days! Or even to put my hair up. My goodness, how casual the world is getting! 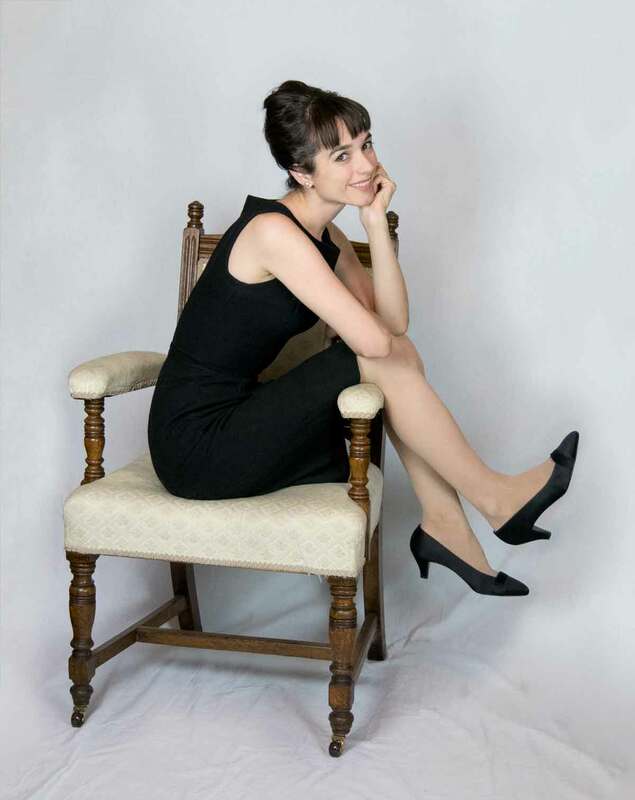 I decided to wear the dress I based on Audrey’s Oscar dress, under a pretty teal blue bolero. The viewing party I got to attend was held at the old Harry Warner estate in Beverly Hills. I SOOOO wanted to see the front of it, and the inside of it, but we were restricted to the back yard, and had dinner and watched the Oscars in a large tent. The pasta was fabulous… I don’t know what was in that sauce… it was sort of a smoky flavour… I loved it! I missed probably half of the Oscars because I was in conversation, or the screen was blocked, and we had to leave a bit early for this other Oscars after-party I was committed to, but all in all it was a good evening! And now I thought I’d make my own little thank you speech here! I’m just so grateful for everyone who has believed in me, who continues to believe in me and offers their support and assistance in reaching my goals, especially this one. The film industry is a tough one to break into, and to be in, and a person can definitely get discouraged when all you hear is no, no, no. 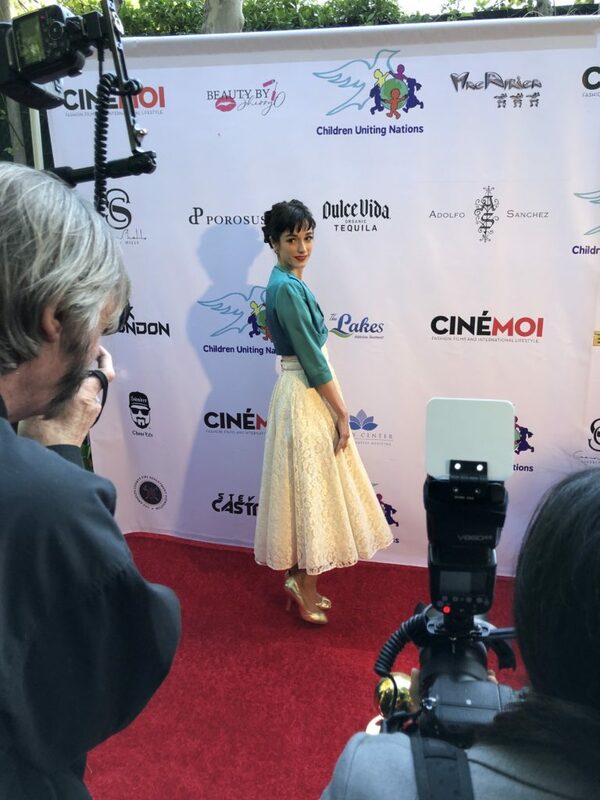 The week I learned about this Audrey project, I was taking time for myself to decide if I would make the decision to quit pursuing acting for good. I was really re-evaluating my life and gathering courage to move in another direction. And then one sleepless night in London, around 3AM I believe, I was scrolling through Facebook and saw the Variety article. It was as if the universe were saying ‘no, don’t quit yet. Here is the project you’ve been waiting for, here is the thing that will re-light that fire, that passion for acting that got lost along the way. Give everything you’ve got, one more time, and if it’s not enough, then you are free to stop. And if it is enough, then you’ve finally achieved what you came to L.A. to achieve.’ And it really means a lot to me to have you, my lovely reader, cheering me on. Because I may have dreams and goals but I’m not the most self-confident person. And I can’t do this alone. Every word of encouragement and every kind gesture matters and makes a difference, and if in a year from now I can be thanking you again for getting me into my dream role, you have no idea how happy I will be! There’s one thing I’ve never been much good at, and that’s critiquing artistic works, writing reports on anything, analyzing thing, or in general doing any of those things you’d get graded on in school. Which is probably the main reason I ended up skipping college and heading straight to work in Los Angeles. 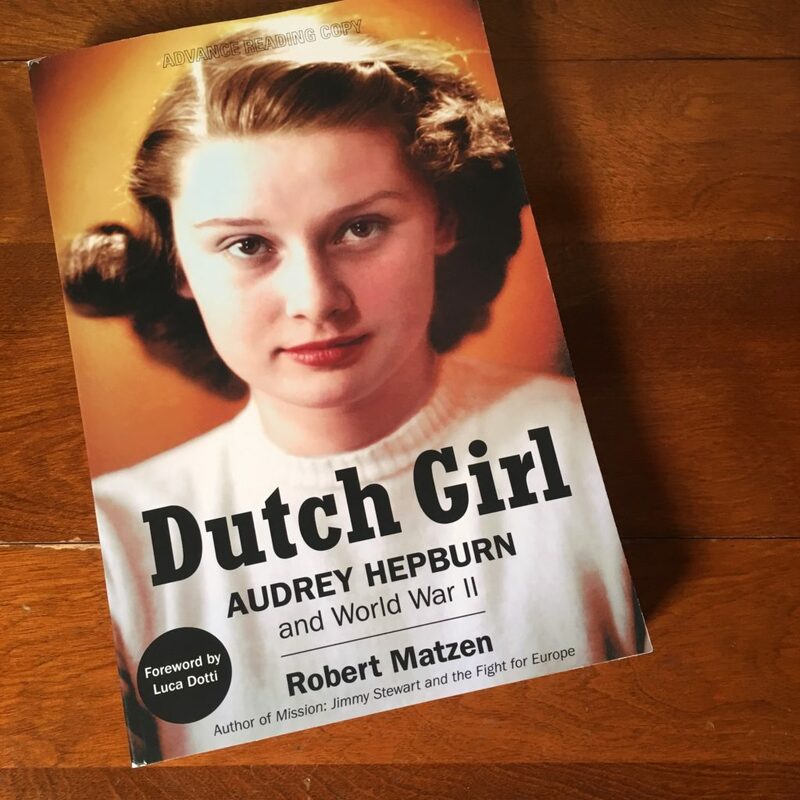 However, I was lucky enough to receive an advance copy of Dutch Girl, a book on Audrey Hepburn’s years in Holland during World War 2 by Robert Matzen (Hi, Robert!!! ), and of course I have to say something about it here! In general, I’m not a fan of books or films about war. However, following one person’s experiences during a time of conflict does capture my attention. I suppose it’s that connection you can more easily make with one human, versus trying to empathize with thousands of general experiences, or be interested in humans killing other humans en mass. The details make it relatable, and you’re rooting for that person to make it through. You’re learning about a real human experience, and not just being bombarded with names and dates and battles and death. I won’t be able to repeat back any names of generals or dates of battles, but I will remember what the people of Velp and Arnhem and so many other cities suffered when I walk their streets later this year… I will appreciate what these people had to go through, as innocent victims of war. We are all very lucky that Audrey made it through. It was interesting to read in more detail what those years were like for young Audrey. It’s difficult to imagine having to live through these things, having your life disrupted and affected so much. Intellectually, I know that this is still happening to so many around the world. It’s easy to forget, when you’re in the middle of living your own pretty safe and standard life. It was heartbreaking to read about her uncles’ capture and killing. One of them kept a journal during his captivity, parts of which are shared in the book. He and his wife were so brave and strong… I doubt I would have been as courageous under the same circumstances. I would want to be. But I know myself and I would probably be the angry defiant prisoner! Who really knows… I hope never to find out. Speaking of Dutch, I’ve started taking Dutch lessons from a teacher on iTalki.com, which is also where I found my French teacher. And once I get the hang of Dutch (hahahaha… oh my goodness it’s taken me ages for French, let’s see how this goes), I’m going to add in a little Italian before I reach Italy. I know I’m not going to reach any kind of fluency in the next year, I would be happy getting to A1 level. I’ve always wanted to be multilingual, but haven’t put enough effort into it. Thanks to Audrey though, I’m getting a little push off on the languages and dancing. Fortunately, I do have at least two Dutch friends I can practice a little with before I get to Holland. And three Dutch relatives that I haven’t seen in years but I’m sure they would be happy to hear from me! I can’t wait to look back on 2019 and see all the new things I’ve learned, all the new people I’ve met, all the new adventures I’ve had….